(a) What is the resistance of a 220-V AC short circuit that generates a peak power of 96.8 kW? 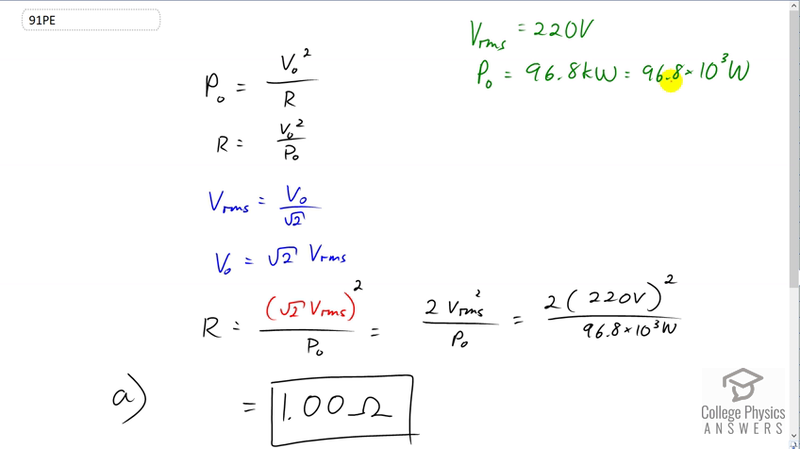 (b) What would the average power be if the voltage was 120 V AC? This is College Physics Answers with Shaun Dychko. So we have a 220 Volt short circuit, with a peak power output of 96.8 kilo Watts which is 96.8 times ten to the three Watts. Now this 220 Volt figure given to us, we have to assume as an rms voltage. We always assume that unless the question specifically says otherwise. So the peak power output is the peak voltage squared over R. But we don’t know what the peak voltage is. And we are going to substitute for it in a second. But first let’s solve this for R, by multiplying both sides by R over peak current. And this gives us R equals the peak voltage squared over the peak power. Now we’ll figure out a substitution for the peak voltage in terms of the rms voltage that we know. By using this relation here, we know that rms voltage is peak voltage divided by root two. And so we solve for V naught bu multiplying both sides by root two. And so the peak voltage is root two times Vrms. And this we substitute that in for V naught. And since this is squared, this root two squared becomes two times Vrms squared over the peak power. It says two times 220 Volts squared divided by 96.8 times ten to the three Watts. Which means the resistance is 1.00 ohms. Now the average power output of this short circuit is going to be the rms Voltage squared divided by resistance. And we calculated the resistance in part a. And so we have 120, if there was on 120 Volt circuit, there will be a 120 Volts squared divided by one ohm which will be 14.4 kilo Watts.